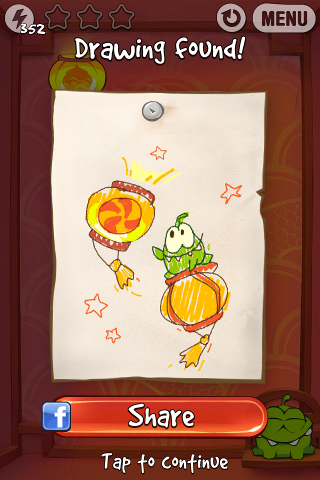 Just 4 weeks after releasing the previous 13th box "Steam Box" for "Cut The Rope", ZeptoLab has suddenly released a NEW 14th box called "Lantern Box" to celebrate Chinese New Year ! An 18th "Om Nom Drawing" (shown in above screenshot) has been added in ver. 2.2 of "Cut The Rope". For the complete set of "Om Nom Drawings", please read the article "Locations of Om Nom Drawings". The NEW device is a "lantern" and whenever the candy gets in any lantern, you can tap on ANY lantern to release the candy. The "Ghost" element introduced in the 12th box "Spooky Box" used to be able to morph into only 2 types of objects out of the 3 variations: (1) bubble, (2) bouncing pad or (3) hidden/automatic rope. But the upper "Ghost" element in Level 14-11 and the one in Level 14-19 can morph into ALL 3 objects. 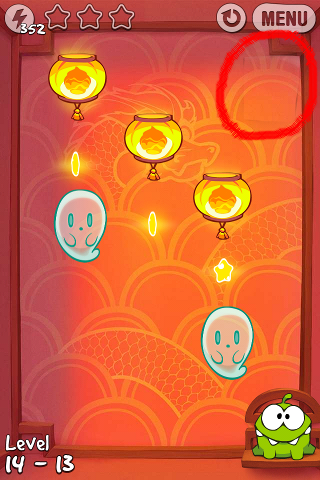 If you want to know more about the "superpower" feature, you can read this article: "Cut The Rope: Experiments" ver. 1.4 now has "Superpowers" !